At times it seems difficult to keep up with the technology that’s available to make our lives simpler and more convenient. That’s because smart devices and companion pieces are coming up almost daily. Now, there is a standalone accouterment for runners and hackers that allow users to leave their smartphones at home. 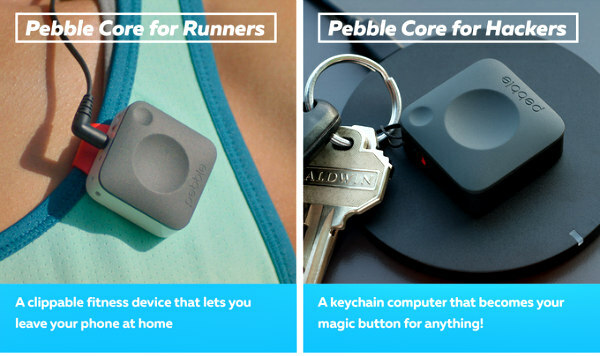 Pebble puts them out, and runners can merely clip the device to their clothing or gear and listen to music during their workouts or access GPS, and hackers have the option of using it as a key chain attachment like an anti-theft/keyless entry fob in the same manner as runners. It’s called Core. When a lot of people hear the word “Pebble,” they might think of smart watches with super-long battery lives. Those watches run on Android or iOS operating systems and at least have screens, even if they aren’t much bigger than a large postage stamp. The Core, on the other hand, is a screenless wearable that’s about the same size as a fob but does, oh, so much more. These small dongles have built-in GPS, a 3G modem, and they play Spotify playlists over 3G or Wi-Fi. Pretty cool, but will it be enough to entice users to leave their watches, music players and phones at home? That’s the $64 question (it’s not worth $64,000). While primarily aimed at walkers, hikers and runners, just about anyone can use it. It comes with a 3.5mm jack for headphones and pairs with wireless earbuds over Bluetooth. Besides streaming music and figuring out where you are or where you want to be, the 3G-modem allows users to call for an Uber ride by setting up a dedicated command or to send an SMS, if you’re in a pinch. Because there is no screen, you’ll have to rely on audio cues to use it, but the 3G allows users to access third-party VoIP apps to place calls through a headset with a microphone. Interestingly, the Pebble Core does not run on the company’s own OS system. It instead runs on Android OS. This comes as a bit of a surprise, but Pebble founder and CEO Eric Migicovsky feels this will have benefits that could possibly be twofold: first, its capabilities are expanded by running third-party apps, and, secondly, it could make it more appealing to hackers. The Core could also be used to control things like lights and other smart operating systems. But it’s really the GPS with its ability to share data with Google Fit, Strava, Under Armour Record, Runtastic and MapMyRun plus the music streaming that makes these devices the most desirable. According to the manufacturer, the Core should get roughly nine hours of battery life with internal playback (it’s got 4GB of built-in storage) and 4 hours when used in conjunction with streaming music. If you’re using it solely for the GPS, you purportedly can get up to 20 hours on one charge. Speaking of which, the devices work with Qi wireless charging technology. The new Pebble Core just launched on Kickstarter a few days ago, so you can head over to their campaign and check them out yourself. KJB Security Camera Lens Cup Has an Eye on You... And a Cup a' Joe.